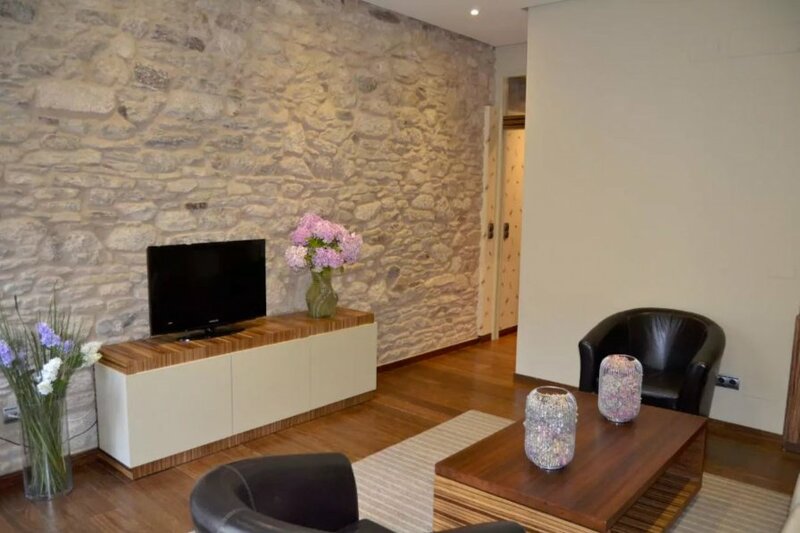 This apartment is located in Santiago de Compostela and sleeps 2 people. It has WiFi. The apartment in Santiago de Compostela, A Coruna, has capacity for 2 people and has 1 bedroom and 1 bathroom. The accommodation is 45m2, modern and nice, is located into an animated neighborhood and in the town. The accommodation is equipped with coffee maker, dish washer, dishes and tableware, freezer, microwave, Toaster, pan, juicer, dryer, iron and ironing board, washing Machine, hairdryer, linen - bed sheets, independent kitchen, safe-deposit box, toilet, elevator in the building, WIFI Internet, bathroom with shower and balcony. It is located 38 Km from the Sand Beach Playa Noya, 38 Km from the Stone beach Playa Noya, 14 Km from Golf course real Aeroclub Santiago, 0.35 Km from Supermarket Supermercado Gadis, 13 Km from Airport Aeropuerto de Santiago de Compostela and 0.1 Km from Natural Park Parque Alameda.